First, as Mat Callahan incisively points out in The Explosion of Deferred Dreams: Musical Renaissance and Social Revolution in San Francisco, 1965-1975, much of what’s commonly understood to have happened during this blissful moment – didn’t. Or, at least not as it has entered mainstream history. Then, as now, actual events got spun by the media to appear different than they really were. And second, perhaps more importantly, by focusing on the bright shiny objects of the time we overlook the deeper forces at work. Yes, light shows, paisley shirts, and weed were cool, and even in a certain way stuck it to the man. But what really stuck it to the man in 1967 were massive protests against the war in Vietnam. 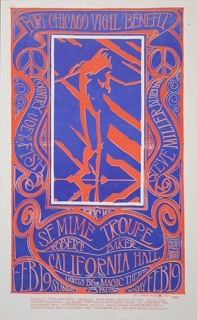 These are 1967 posters you won’t see at the DeYoung exhibition. True, it was the fantastic rock art that began the poster renaissance of the 1960s. But what people forget is that the withering of the long cold arm of anticommunism that squelched protest posters for 20 years (not one was evident during the 1964 Free Speech Movement) also freed social justice art. 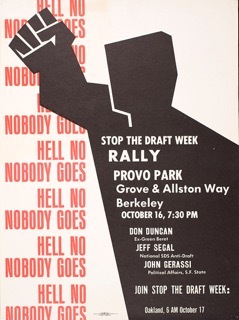 “Hell No – Nobody Goes” was the second in a series announcing Stop the Draft Week, a nationwide initiative whose Bay Area focus was to derail the efficient operation of the Oakland Army Induction Center. The first, a text-only version, used the slogan “Hell No – We Won’t Go!”, but evolved to the more inclusive slogan with a bold silhouette raising a clenched fist. “Port Chicago Vigil Benefit” is a classic fusion of counterculture and New Left. A swaying naked woman (this was still the dawn of second wave feminism) drew eyes to support anti-war demonstrators blocking the entrance of the Concord Naval Weapons Station, hoping to halt shipments of explosives, napalm, and Agent Orange (think “chemical weapons”) destined to be dropped on the people of Viet Nam. 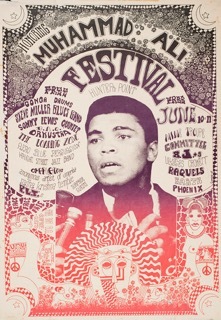 The “Honoring Muhammad Ali Festival” benefit in Hunter’s Point wasn’t about boxing. Ali refused induction into the U.S. Army on religious grounds on April 28, 1967, and was critical of U.S. military involvement in the war, stating “I got no quarrel with them Vietcong.” 49 years later 49ers Colin Kaepernick would “take a knee” for civil rights. 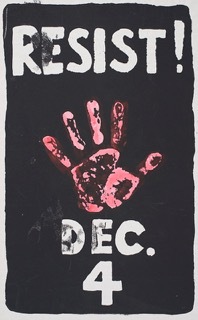 And finally, “Resist!” was the second of two produced by Los Angeles’ nascent Peace Press. 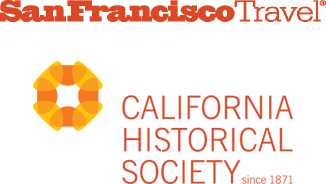 The first was for Vietnam Day Committee actions October 16; this was for the December 4 national draft-card turn-in event. Some 500 protesters witnessed 88 draft cards collected and burned at San Francisco’s Federal Building. Resist, indeed. Love trumped hate in 1967.